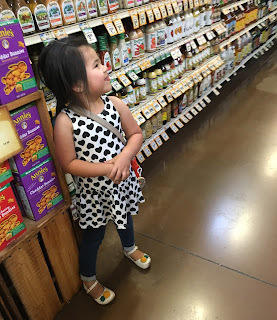 I am currently on day 4 of the #septemberwhole30 challenge (hence, the photo of Luna at Sprouts). It is too early for me to convince any of you to join me on my Whole 30 adventures. I feel lighter, but bit cuckoo. I'll keep you posted. Luna had her first day of preschool, and the world did not stop. We both survived without a scratch. I have been working on creating a self-care plan that best suits me. I know that may seem counterintuitive, but simply "trying" to relax is not enough. I love this new series on Design Sponge called The Beauty of Self-Care. I am reading Money Making Mom by Crystal Paine. She has a few other books and they all provide great tips. I have been watercoloring a lot. I like it because its not as messy and its not just a craft I do with Luna, I actually enjoy it. I've been stalking Anna Pole's Instagram. Her paintings are always so serene. I've been listening to the Everything Will Be OK playlist because I know everything will be okay.